← Does Your Chicken Need a Support Bra? 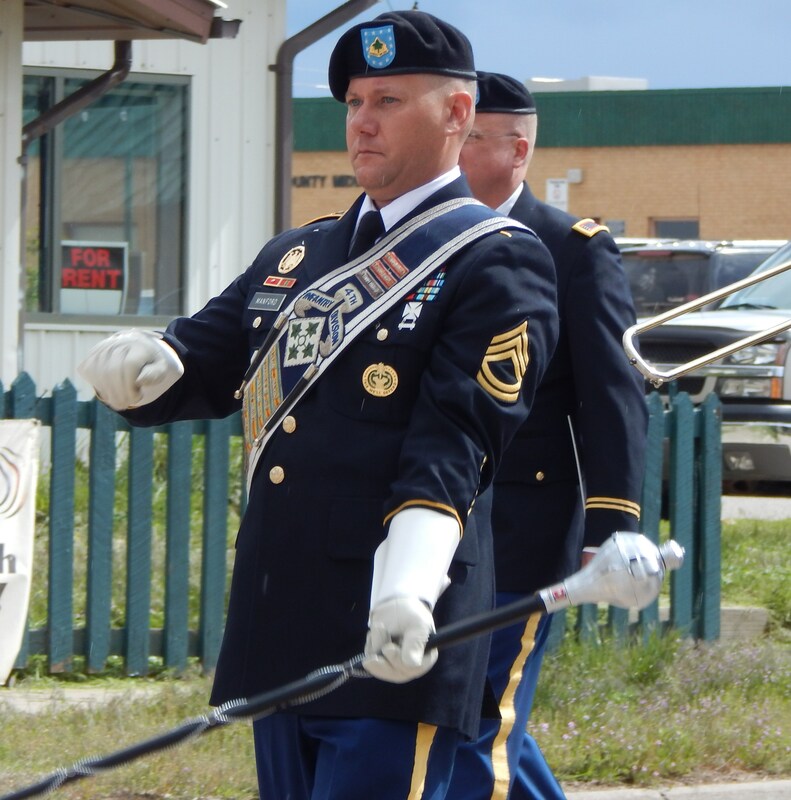 The Fort Carson Marching Band comes to Westcliffe. Memorial Day, coming in as it does at the end of a Four-Day Weekend, is almost anti-climactic. How can cleaning the family cemetery plot and refreshing faded flowers compete with Saturday’s parade? How can a solemn memorial service on Monday compete with Saturday’s parade? The martial music, the marching soldiers, the flying flags, the high-stepping horses, and the children make for a festive springtime welcome. Welcome to such a degree that we sometimes lose sight of the reason for Memorial Day. My childhood memories of Memorial Day are many. As a child, I loved going to the cemetery on the Sunday prior to Memorial Day. A stocky, peasant woman, the same woman every year, stood at the entrance of the New Forest Cemetery in Utica, NY. She stood surrounded by buckets of homegrown, purple iris. My grandfather would buy iris by the armful, and then we would drive at a funerary pace to the family plots. The adults would tidy the graves, but as soon as we arrived, I would run to the nearby, life-size statue of a little boy – a boy who had run away to join the circus. Sophisticated beyond my five or six years, I knew all about circuses. Every year Barnum and Bailey would come to town, and my grandfather would take me down to the train depot to watch the train arrive. The lions and tigers and bears would arrive in a flourish. Some children were set atop the camels. I would have loved to ride a camel, but I knew how far my treat would go. My treat was to see the elephants raise the Big Top; riding a camel was a treat too far. I knew better than to ask. How I loved the circus! This statue of the little boy who ran away to join the circus captured my imagination. 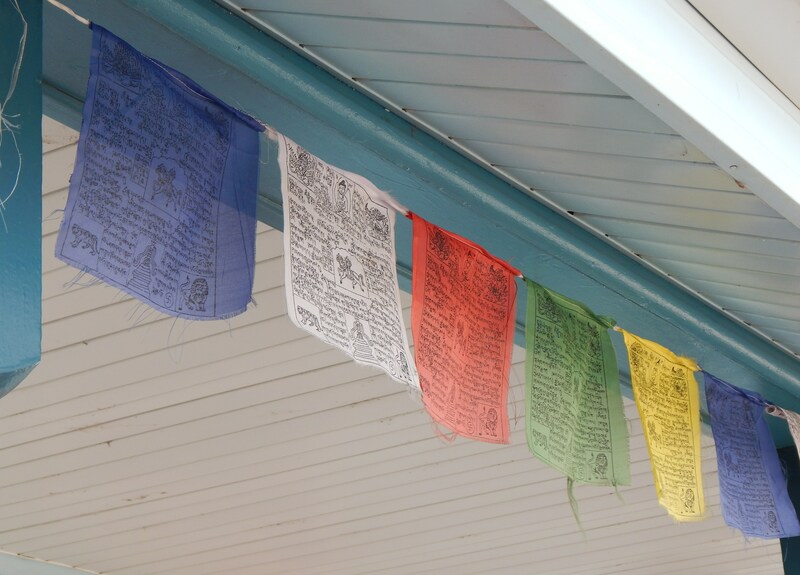 To run away… to join the circus… to sense, from afar, the family lamenting the loss of me. They would miss me when I was gone. No doubt, they would love me more. Maybe they’d erect a statue of a little girl who has run away to join the circus. The Romance of the story had great appeal. It was tempting to think of running away. Remembering that this flag once draped a soldier’s coffin. 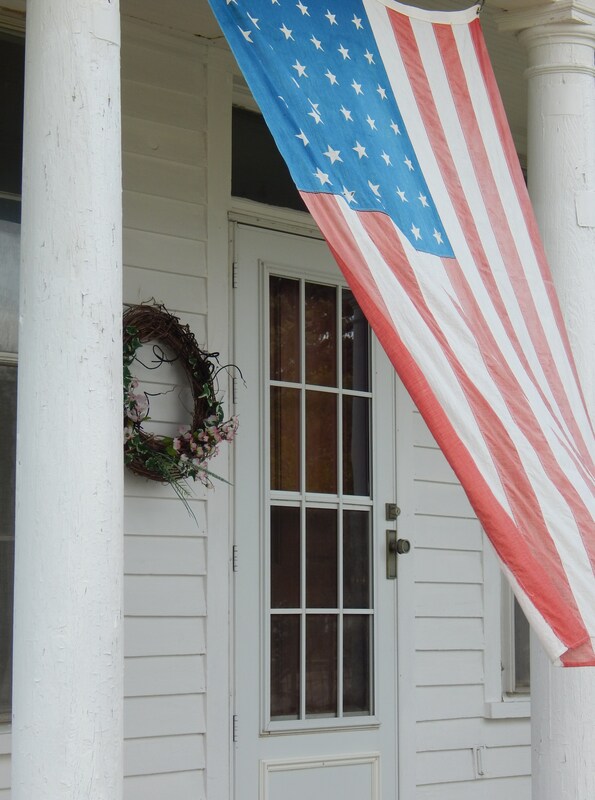 As an adult, I begin Memorial Day weekend by hanging a flag from our front porch. The flag itself is faded and in some places tissue paper thin. It is fragile and 48-stars old. I’m not much of a flag waver. Flag waving seems too Imperialistic to me, but this flag came to me; I did not come to it. Some years ago, I went to the Methodist Church yard sale, and what did I find but a 48-star, casket flag. I was appalled. I know all about downsizing, but to put a family casket flag up for grabs… to set it out between a pair of hardly warn, knee-high boots and a cracked butter dish resting on a ratty bath mat was too much. What was that family thinking!! Did they not honor their father’s service to his country? Well… if they weren’t going to honor their father’s service, I would. So I fly the flag. It is past its prime. Every time I hang it, I think that perhaps this is the last year. But every year, I give it one more airing. 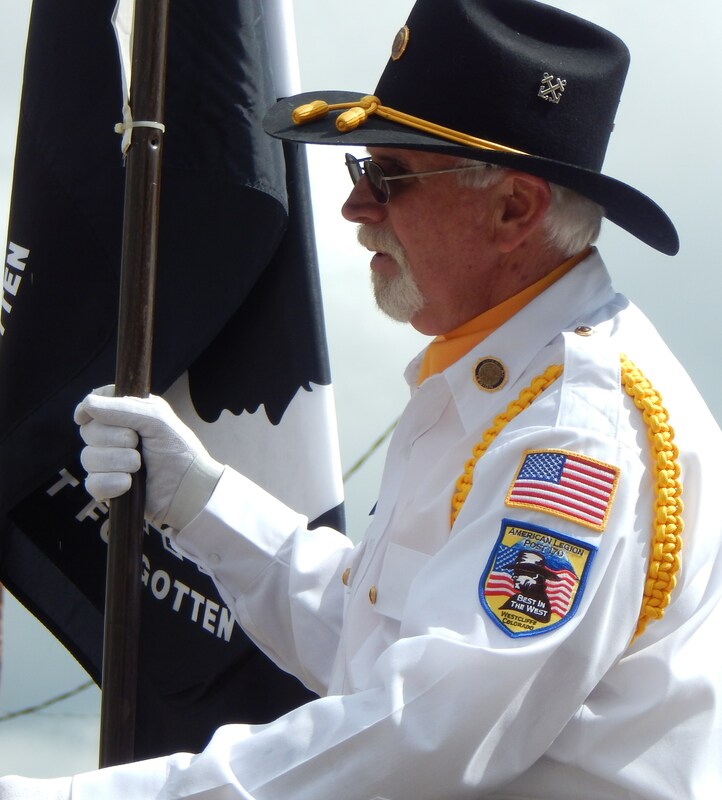 Not so much for the flag, but for the soldier who marched under its colors. I love that: the dead hovering as a cloud of witnesses. May we strive to do better in all aspects of our lives so that we do not embarrass those who have gone before. May all our soldiers, past and present… living and dead… sleep in peace. 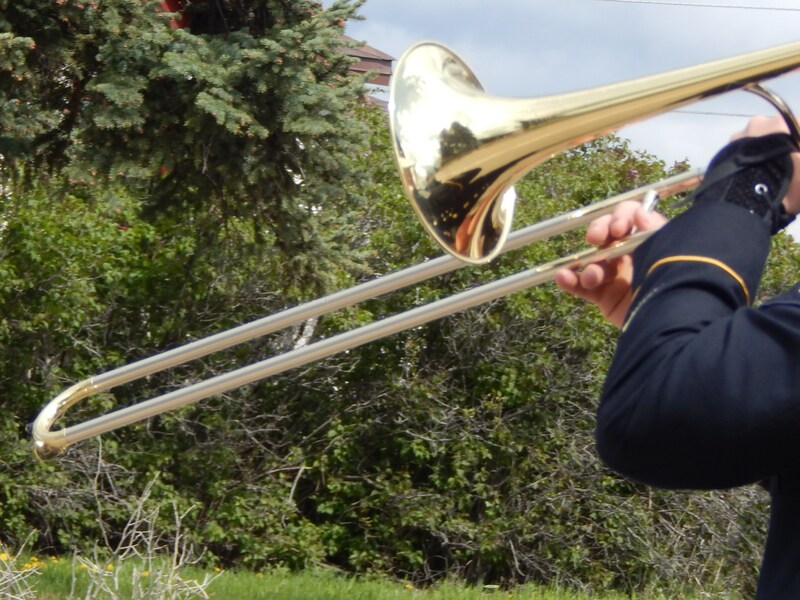 This entry was posted in Uncategorized and tagged " Westcliffe CO, Fort Carson Marching Band, Harriet Beecher, Henry Ward Beecher, Memorial Day, New forest Cemetery, Tibetan Prayer Flags, Uncle Tom's Cabin, Utica New York. Bookmark the permalink. Very nice, Doris, and very well said. Wonderful memories to have, too. Thank you, Brent, Marty, and Sarah. I enjoy the writing, but I especially enjoy knowing who my readers are.